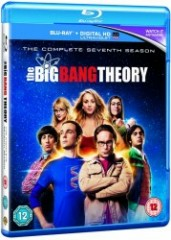 The seventh season of The Big Bang Theory was released on DVD and Blu-ray in the United Kingdom today. A multi-season box-set of Seasons 1-7 is also now available on DVD and Blu-ray. The Big Bang Theory: Season 7 DVD The three-disc box-set includes all twenty-four episodes of The Big Bang Theory's latest season. The episodes are presented in widescreen with Dolby Digital 5.1 Surround Sound. The bonus features are a Gag Reel, String Theory Serenade featurette, James Earl Jones: The Un-Conventional Guest Star featurette, BBTea Time featurette, The Big Bang Theory's May the 4th featurette, The Big Cendrowski featurette, the 2013 Comic Con Panel and Johnny Galecki Crashes the BBT Writers Panel. The DVD also includes Ultra-Violet digital downloads of the episodes (available in the UK only). The DVD includes English, Danish, Dutch, Finnish, French, Norwegian, Spanish and Swedish subtitles, along with French and Spanish dubbed audio complementing the English track. The Big Bang Theory: Season 7 Blu-ray The two-disc Blu-ray box-set includes all twenty-four episodes of The Big Bang Theory's seventh season in high definition. The episodes are presented in 1080p widescreen with DTS-HD Master Audio 5.1. The Blu-ray has the same special features as the DVD and also includes Ultra-Violet digital downloads of the episodes (available in the UK only). The Blu-ray includes English, Portuguese Brazilian, Castilian, French and Korean subtitles, with Portuguese Brazilian and Spanish dubbed audio complementing the English track. The Big Bang Theory: Seasons 1-7 DVD This twenty-disc DVD box-set includes all one hundred and fifty-nine from the first seven seasons of The Big Bang Theory. The episodes are presented in widescreen with Dolby Digital 5.1 Surround Sound. The original bonus features are present on each season's DVDs, including gag reels and behind-the-scenes featurettes. The Big Bang Theory: Seasons 1-7 Blu-ray This fourteen-disc Blu-ray box-set includes all one hundred and fifty-nine episodes of the first seven seasons of The Big Bang Theory in high definition. The episodes are presented in widescreen with DTS-HD Master Audio 5.1. The original bonus features are present on each season's DVDs, including gag reels and behind-the-scenes featurettes. The Big Bang Theory: Season 7 will be released on DVD and Blu-ray in the United States and Canada on Tuesday, September 16. The DVD and Blu-ray are set to be released in the United Kingdom on Monday, September 8.